If you own a home aquarium, there may come a time when you have to combat various issues like algae, bacterial infections, and other nuisances. Wouldn’t it be nice if there were a way to prevent these problems entirely? Well, you may be in luck—a UV sterilizer help avoid exactly these issues. A UV sterilizer provides some significant benefits, which improve both the health and the aesthetic appeal of your home aquarium. Read on to learn about what a UV sterilizer is, how it combats excess algae and bacterial infections, and how to choose one that’s right for your tank. If you're new to aquariums, check out our more complete aquarium maintenance guide first! 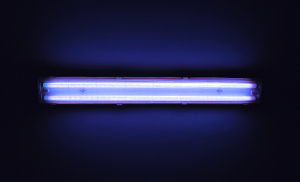 If you’ve ever been to a tanning salon, you’ve likely seen what a UV lamp looks like. You might be imagining that a UV sterilizer in an aquarium would look the same, casting an eerie blue light through the water. However, this isn’t always the case. Often, the bulb is enclosed in the sterilizer’s housing, and isn’t visible from the outside. A UV sterilizer is essentially just another component of your filtration system. You place it last in your filtration line, after your mechanical filter. Water then flows through the sterilizer and is exposed to ultraviolet light. This light sterilizes the water, killing parasites, viruses, algae, and any other microorganisms in the water. It does this by irradiating these microorganisms with light at a wavelength that mutates their DNA. This mutation makes them unable to reproduce, thus halting the growth and spread of infections. Yet since it only affects free-floating microorganisms in the water that passes through the device, there’s nothing to worry about with your livestock. These devices are used in swimming pools as well as in factories that need to sterilize liquids, but a UV sterilizer can also be a useful addition to your home aquarium. So, what are the benefits? There are a lot of factors that can contribute to bacterial infections and parasites. The most common cause is when new livestock is introduced. They can often be carrying diseases or parasites you don’t know about. Don’t properly quarantine them, and you can end up with an outbreak on your hands. Another cause may be if your livestock grow in numbers to the point that they become more susceptible to disease. Either way, your home aquarium may be at risk. A UV sterilizer helps prevent this from occurring. Any free-floating parasite or bacteria in your home aquarium will flow through the UV sterilizer. The sterilizer irradiates these microorganisms just enough to mutate their DNA, rendering them unable to reproduce. This effectively halts the spread of these infections, potentially saving your fish and other livestock from expensive or even lethal health issues. Keep in mind, though, that this will only affect free-floating microorganisms that pass through the device. It has no residual effect and won’t kill parasites that have attached themselves to fish, such as adult stages of ich. In addition to bacteria and parasites, UV sterilizers also kill algae, another variety of microorganism that often gives aquarists trouble. Algae are the aquatic microorganisms that form green slimes on your aquarium surfaces and cause your water to become murky. It’s natural for aquariums to have at least some algae, but excessive algae can impact the aesthetic appeal of your home aquarium, and even the health of your fish depending on the type of algae. Contributing factors include excess nutrients and high light levels. However, there is a solution: a UV sterilizer. By showering algae with ultraviolet rays, a sterilizer kills it in the same way it kills other microorganisms. The radiation mutates its DNA and it dies off, unable to reproduce. Because algae contributes so much to the turbidity of the water in your home aquarium, eliminating free-floating algae goes a long way in improving the clarity of your tank. Install a UV sterilizer, and you’ll notice almost immediately how much clearer the water gets, and how much more easily you can see everything within. Your home aquarium can go from murky and greenish to clean and clear with minimal effort. This is especially useful for beginner aquariums, where you may not have quite gotten the hang of things yet and you’ve added too many nutrients or too much light. Remember though, a UV sterilizer only works on free-floating organisms. It won’t work on string algae and other species that attach themselves to rocks, substrate, fish, and other surfaces. Only microorganisms that flow to the device with the water will be affected by it. How Do I Choose a UV Sterilizer for My Home Aquarium? There are a handful of different things to consider when deciding to install a sterilizer. These include wattage, flow rate, and maintenance. As a result, three factors affect the sterilizer’s performance: bulb strength, contact time, and UV penetration. Bulb Strength: The higher the bulb’s wattage, the more radiation it showers the microorganisms with. Replace bulbs twice a year to keep the sterilizer effective. Contact Time: The more contact time microorganisms get with UV light, the more thoroughly it will kill them. This is affected by the sterilizer’s flow rate. The slower the water flows through the sterilizer, the longer it’ll be exposed to UV light. Different microorganisms require different amounts of UV light to kill, and so require different flow rates. Longer bulbs will also expose them to UV light longer, producing the same effect. UV Penetration: To kill the microorganisms in your home aquarium, the UV light has to be able to reach them. If the water is too turbid, UV light may not be able to penetrate to these microorganisms effectively. This is why you place the sterilizer after the mechanical or biological filter. It’s also why it’s important to keep the lamp and sleeve clean, to prevent a film or mineral deposit from forming and blocking some of the light. So, could your home aquarium use a UV sterilizer? If you have questions about these and other solutions for improving your home aquarium in Crystal Lake, IL and the greater Chicago area, give Living Art Aquatics a call at (847) 737-5151. Our experts have been creating vibrant aquatic seascapes for many years, and are always on hand to answer your questions!